Spain´s Dakar-rookie Óscar Fuertes is still unstoppable in the Dakar, where he has passed another stage behind the steering-wheel of the all-new SsangYong TivoliDKR Buggy, built by Herrador. 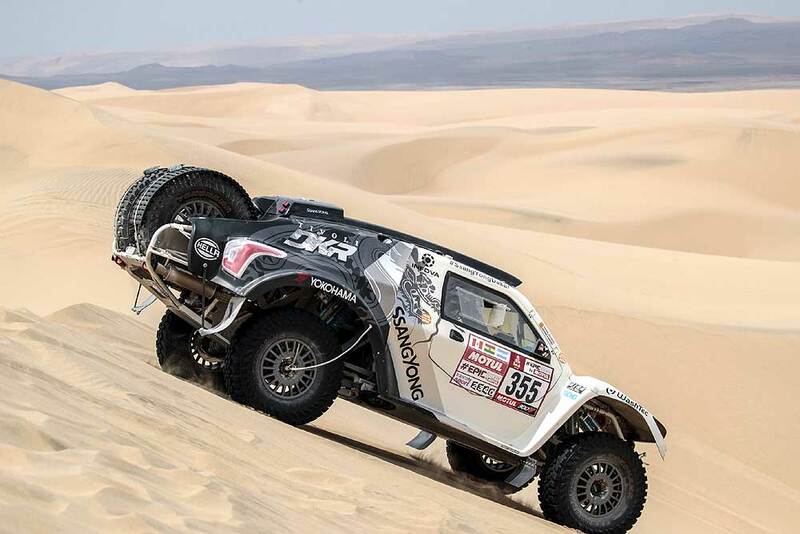 The driver from Madrid, along with his co-driver Diego Vallejo, finished this third stage between Pisco and San Juan de Marcona in 47th place, with a time of 05:51:51 hours, 02:42:43 behind the stagewinner. In the overall standings, the SsangYong Motorsport team climbs to 43rd place, 06:41:49 behind the leader Stéphane Peterhansel. Fuertes now figures as the third best Spanish in cars, behind only two veteran drivers like Carlos Sainz and Isidre Esteve. Regarding the categories of Rookies and T1.3, Óscar occupies the 6th and the 5th place in them, respectively. "This stage has been even harder than Sunday's," he said. "Everything is new to me and it is the first time that I compete in dunes. "The TivoliDKR goes very well in this and we are happy to be ahead of much more experienced teams. It is a luxury to have such a competitive vehicle," says the satisfied debutant. "Oscar is becoming better every day and we're getting closer together," said navigator Diego Vallejo. "We are getting used to the hardness of this Dakar, which we already expected, but it is even a little bit bigger than we thought. The only tense moments have come when we mixed up with the trucks. We almost hit one! Fortunately, nothing has happened and we could continue without problems," explains Vallejo. "The goal for today is to continue enjoying as before and to finalize a new stage," added Óscar Fuertes.